-USB Type C 3.1 Adapter is an ideal solution for connecting USB-C devices to VGA equipped displays. -Plug and Play, no software or drivers needed. -VGA Port Max support to Display 1920x1080 Resolution with 60Hz. -Suitable for type-c USB 3.1 port device. -Compatible operation system: Windows XP/Vista/7/8/10, Mac OS 9.X/10.X. 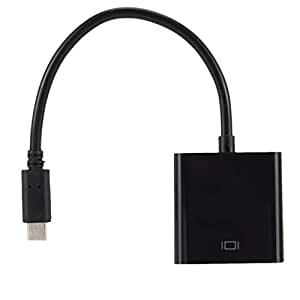 - -USB Type C 3.1 Adapter is an ideal solution for connecting USB-C devices to VGA equipped displays. - -Plug and Play, no software or drivers needed. - -VGA Port Max support to Display 1920x1080 Resolution with 60Hz. - -Suitable for type-c USB 3.1 port device. - -Compatible operation system: Windows XP/Vista/7/8/10, Mac OS 9.X/10.X.